236a/b/c: Shirou tosses his swords. b version = Shirou throws one sword forward and the other at a 45° angle. a version = Shirou throws one sword forward and the other at a 45° angle. c version = Shirou throws both swords at a 45° angle. 623a/b/c: Shirou slashes with his swords. a version = Shirou slashes with both swords. b version = Shirou jumps forward and slashes with both swords. 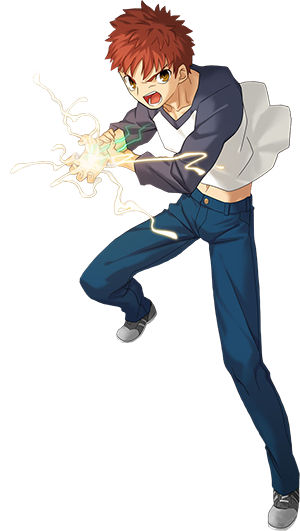 c version = Shirou slashes upwards with a single sword. Launcher, requires meter. Not jump cancelable. a version = Shoots two arrows upwards, they land midscreen. b version = Shoots 3 arrows rapidly. c version = Shoots a single arrow, does knockdown. a version = dash, feint, no attack. b version = dash, then 2b, possible to combo after. c version = dash, then a 5a-like launcher, jump cancelable. Overhead. 236236a: Caliburn trace super. 2100 damage. 236236b: Kansho & Bakuya Overedge. If the opponent blocks the first attack, he is hit for 2500 damage. Otherwise, it hits for 600 damage. Shirou regenerates health at a faster rate than normal. 236236c: Shirou uses Nine Live Blade Works and slashes with Berserker's sword. Against Kirei, Shirou pulls out the Azoth Dagger, stabs him and releases the mana in the dagger instead. Only works at throw range. 4000 damage. Basic combo. You can replace 236236a with 236236c for about 3k more damage if activated.